Dear Friend, before you join Oriflame you must answer one important question. Welcome to my blog. Listen, I know that you probably want to join Oriflame for some reason best known to you. But I have a quick question for you. Would you answer that question? 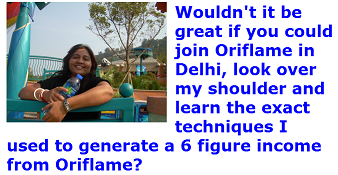 I want to know if someone was making 25,000 to 50,000 per month from Oriflame in Delhi and if that person would be willing to teach you how to do that, how much would you pay that person to learn it? Click here to fill the Oriflame Sign Up Form for express joining. Most people who are really serious about their dreams and their future would find this kind of coaching and support valuable. Since you are going to be part of my Oriflame team this is available to you for free but you have to show your seriousness to keep it ongoing.